Compliance is one of the challenges facing the trustee of a Self Managed Fund. One of the key areas of importance (and the stated focus of the ATO) is the definition and use of the investment strategy. MySF Manager enables you to define your investment strategy and compare your investments against this strategy quickly and easily. In fact, as soon as you open MySF Manager, you will see how your actual investments compare with your planned allocations so action can be taken if needed. In each case you can enter a percentage of the total fund which is planned to be allocated against that category. For example you can say that 15% of our total asset base is planned to be in international shares. However because it isn’t always possible to be so precise about values, you can add a tolerance (+ or -) of say 5%. This means that if the amount of the fund invested in International Shares is between 10% and 20% of the total then it is considered to be 'in line' (or compliant) with the strategy. The list of asset allocation categories can be tailored to suit the needs of your SMSF. The second part of defining the investment strategy in MySF is defining the text. You can add additional section headings as required to document more completely your investment strategy. 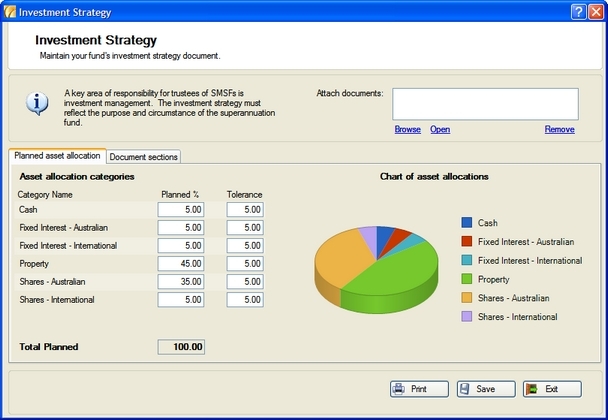 Asset allocation categories are also imported automatically into the strategy document and detail text can be inserted (if required) against each. The SMSF needs to record the decisions it makes as well as any important events that impact on the fund. We have provided a facility to record and store any and all of these decisions within MySF Manager. We would suggest that you discuss what should be recorded with your financial advisor, and then put in place a personal discipline to record the minutes as they occur. You can record minutes quickly and easily, or if you already have the document recorded you can attach the document to your SMSF file as a new minute record. All decisions of the fund can be stored and maintained (and backed up) ensuring it is easier to comply with this aspect of the ATOs guidelines.